As someone who has long advocated the principle of snacks under 100 calories, I’m delighted to see that that Pubic Health England, through their Change4Life campaign, is recommending that children eat snacks with fewer than 100 calories. There’s no harm in adults doing the same! 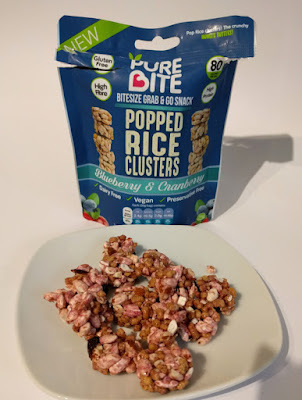 With this in mind I was delighted to receive a sample of a snack by the company Bite UK Ltd called Pure Bites who have snacks with around 80 calories. 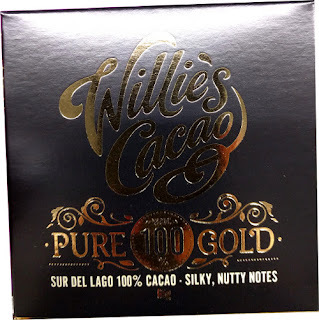 They won a Great Taste Award in 2017 so I was looking forward to finding out what they’re all about. The Pure Bite range consists of rice, nut and coconut baked snack clusters available in five different flavours packed into either 20g or 30g bags. The flavours looked so enticing but I was a bit disappointed to notice that only 2 of the 5 varieties contained under 100 calories per bag. I received the Blueberry & Cranberry snack to try out. It’s a lovely looking pack, lightweight, pretty and enticing. It wasn’t the easiest pack to open, and I had to resort to using a pair of scissors to gain access. As shown in the photo, these little rice snacks are indeed bite sized, about the same width as a pound coin and about 1cm high. There was a mildly sweet berry aroma and they all seem to have held together well. Although they feel a bit sticky to touch, they don’t leave a residue on your fingers. They’re very crispy with little bits of crunchy nuts. There are also soya protein nuggets which help give this snack quite a high protein content (for the size). 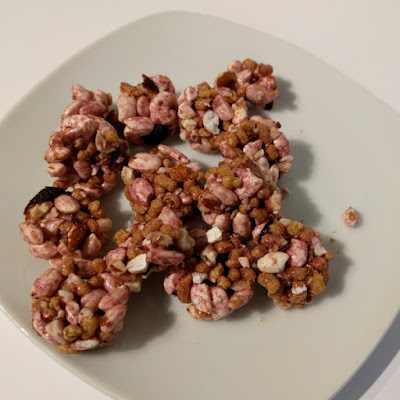 Each bite has one or two bits of blueberry and/or cranberry so you get a chewy and squidgy effect while eating them. I’m not a great fan of dried fruit so would probably prefer the nut clusters, but they have over double the calories per pack. My daughter on the other hand, loved these snacks and was more than happy to relieve me of the rest of the pack. They actually remind me of a snack I reviewed a few years ago by Dole, called Live Right. I haven't seen these around for some time so I guess they've fallen by the wayside. 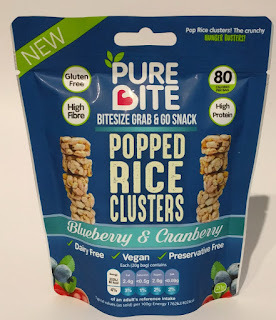 Putting my nutritionist hat on, although Pure Bites are dairy free, gluten free etc, they are still highly processed with many different forms of sugar so I can’t say they’re a healthy snack. But it’s good that they’re calorie controlled which, if eaten in place of a chocolate bar or cake for example, could help with weight control. 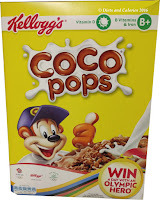 They also have a reasonable amount of protein for the amount in the pack which can help with the satiety factor. 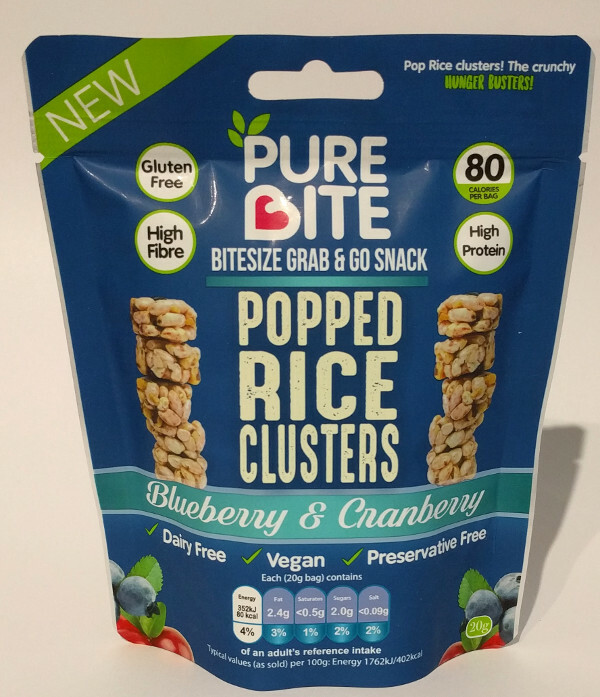 Pure Bite snacks aren’t widely available at the moment. You can find them in branches of Holland & Barrett, Whole Foods and other independent retailers and health food stores as well as Amazon. 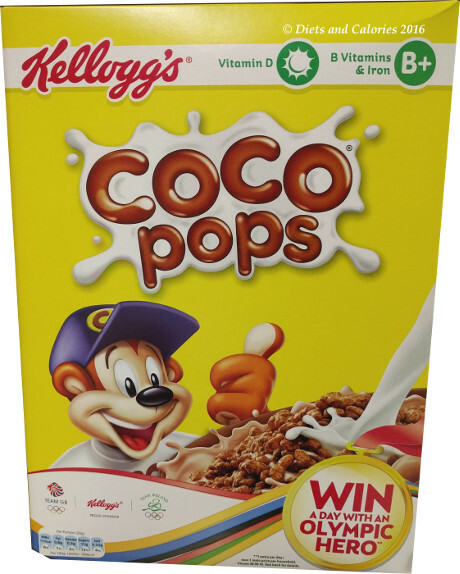 At the time of writing they cost £1.69 per pack. Gluten free, high fibre, vegan, dairy free, preservative free. Nutrition per 100g (Blueberry & Cranberry): 402 Calories, 12g fat, 1.4g saturated fat, 53g carbs, 9.8g sugars, 8.5g fibre, 21g protein, 0.45g salt. Ingredients (Blueberry & Cranberry): Almond (20%), Soya Protein Nugget (20%) (Soya Protein Isolate, Soya Protein Concentrate, Rice Flour), Popped Rice (14%), Dried Cranberry (8% - Cranberries, Sugar, Acid: Citric Acid, Sunflower Oil, Aronia Juice Concentrate), Dried Blueberry (5% - Blueberries, Apple Juice Concentrate, Sunflower Oil), Natural Blueberry Extract, Maltitol Syrup (sweetener), Maltodextrin, Olgiofructose (inulin), Rice Bran Oil, Soya Lecithin, Natural Blueberry Flavour.